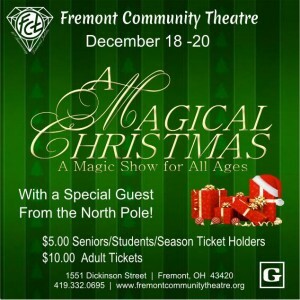 Fremont Community Theatre and Director Diana Cepeda are pleased to present A MAGICAL CHRISTMAS, featuring and written by local magician Floyd Collins. A MAGICAL CHRISTMAS: Featuring Magician Floyd Collins and directed by Diane Cepeda. A normal Christmas magic show gets turned upside down, when one of Santa Elves appears, looking Christmas Magic to get back to the North Pole for the Christmas Ball. Magic and illusions ensue. A MAGICAL CHRISTMAS will be presented on December 18-20, 2015. 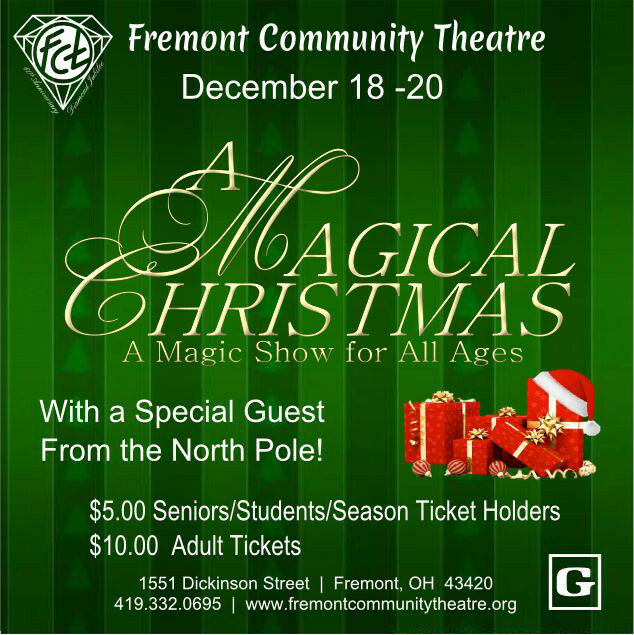 Friday and Saturday nights are at 8:00 p.m., with a Sunday matinee at 2:00 p.m.
Tickets for A MAGICAL CHRISTMAS are $10 Adults and $5.00 for Students, Seniors and Season Ticket Holders. This show has a suggested rating of G.
To reserve seats, please call the Box Office at 419-332-0695. Tickets are also available at the door. PLEASE NOTE: Online ticketing for this production is now closed.